Using wind power to pump water, whether in small or large quantities and using it most often to irrigate crops and/or water livestock. This means of pumping has been used for many centuries now, especially since the thirteenth century in the Netherlands, to drain swamps and to pump seawater in Europe, South-East Asia and Chine. Agricultural windmill pump Source FAO. 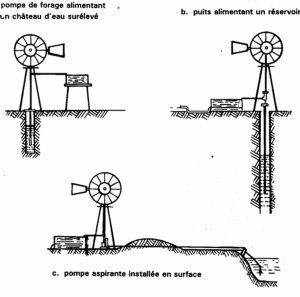 The main kind of pump used in the early twentieth century was the so-called American agricultural windmill pump (see Figure  below). The windmill was located over a piston pump. The industrial version of this pump, made of robust materials and with automated checks on the structure and a service life of close to 20 years is still much used, especially on the vast Australian and Argentinean ranches. Its cost is however prohibitive. Other simpler versions, including some that are actually small-scale workshop types have also been perfected. They offer comparable advantages when in use, even if they are not always as robust or able to be left so on their own to run. These are the pumps covered by the study in this Factsheet. These pumps, although they are less reliable in operation than diesel or electric powered motor pumps, still make it possible to pump large amounts of water (between 5 and 25 cu. metres per day for most models, but up to 100 cu. metres per day, their flow depending primarily on the size of the windmill, the depth of the well and on local wind characteristics) using free power and with few maintenance costs. 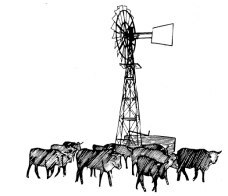 Windmill pumps are mainly used for irrigation and watering livestock. Windmill pumps will operate once the wind speed reaches 10 kph, but they only really work satisfactorily from a wind speed of 15 to 20 kph and it is dangerous to use them when the wind blows at more than 40 kph. The density of the air has a slight influence on these values which need to be increased when the density of the air falls, and therefore when the altitude increases significantly (by around 1,000 metres). These water pumps are therefore competitive with motor pumps in areas where the wind blows on average at less than 15 kph. Generally, this is the case in sparsely wooded regions (savannas, semi-desert and desert regions) or with more cutup terrain. 5) What does this process involve ? How is it used ? First of all, let us restate that there are two types of windmill : windmill water pumps and windmill generators. Their operating principles are fairly similar, as in both cases they use wind power, but windmill generators, seen more and more often around the world as oil reserves dwindle and pollution concerns rise, apply ever more sophisticated technology with different aims. This Factsheet will therefore cover only windmill pumps. - Regardless of the type of pump used in the well, to supply a little electricity for the everyday needs of the farm or farmer’s home. Windmill pumps transform kinetic energy from the wind straight into mechanical energy. They comprise a vane pump or propeller mounted on a shaft and moved into the wind using a rudder, an upper structure with a transmission mechanism leading back to the well, a pump, most often submerged and an outlet for the water under pressure. Although they way they work is simple, windmills are in reality fairly complex machines, except for the most basic entry level models. 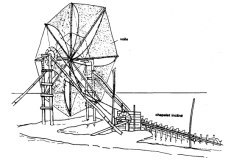 The diameter of the wheel that holds the windmill blades (formerly sails) depends on the depth of the well and how far up the water has to be pushed and on the flow rate to be achieved. The structure’s height and the construction materials used are especially dependent on the maximum wind speed and any obstacles that may be located nearby (none of which must be located within a radius of at least 150 metres). The flow rate achieved by a windmill varies significantly depending on the wind and on pump characteristics. It may sometimes vary from 200 litres per hour to 6 or 7,000 litres per hour. 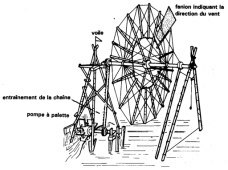 Windmills can be fitted with various accessories, like a mechanism for stopping them from the ground, an access ladder, a way of adjusting wheel rotation speed or even an automatic stopping mechanism should wind speed become excessive (e.g. 10 metres per second). This is why there are plenty of different pump models and especially why the choice and price of a windmill is mainly a function of its characteristics, of the kind of pumping needs to address and of the characteristics of the location where it is installed. They are therefore more bespoke pumps rather than off the shelf pumps. This wide variety is also explained by the fact that a windmill comprises two main elements (the windmill itself and the pumping system). Windmills therefore also differ by the kind of pump that they drive. Generally, piston pumps and centrifugal pumps are used. These are one of the most used kinds of pumps. The wheel that the windmill blades are mounted on turns thanks to the wind. This wheel is mounted on a shaft whose rotating motion is converted into an alternating vertical motion via a lever arm plate or connecting rod. The to and fro motion created in this way drives a water pump piston located down below, through a steel rod. The pump itself is generally immersed in the well. As the torque required to operate is necessarily very high, it is essential to be able to use the slightest gust of wind. The windmill must therefore comprise a fairly large number of blades. The number of blades usually varies from 15 to 18. The curve and number of blades ensure that the windmill can start up more or less easily even if the wind is fairly weak and, for a large part, determine its efficiency. Some characteristics do however, in many cases, make these windmills less interesting than those using centrifugal pumps. This is because the alternating pumping motion causes mechanical stresses through the structure, resulting in faster wear. In the same way, more sophisticated studies of the system show that the ideal operating ranges for the windmill and pump only match over a very small speed range. Hence power losses are very high outside of this optimal operating range, and this therefore requires close matching with the help of a specialist. The operating torque is less than that of piston pumps. So in this case, the windmill need only have a reduced number of blades. These pumps also offer the advantage that they have an optimal operating range that can be adjusted to match that of the windmill, so that the wind driven pump will work efficiently over a wider speed range. The performance achieved by windmill pumps depends on a number of parameters but the two most important ones are wind speed and pumping depth. The pumping mode is itself strongly influenced by the pumping depth and depends on the way the windmill is mounted. 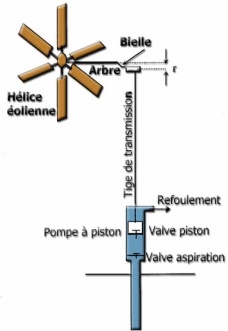 If the windmill is located right over the well, then either a suction or pressure pump can be used, but if the windmill is offset in relation to the well, then only a suction pump can be used. In an offset layout, the windmill can be located as much as 100 metres away from the well, but the suction height is restricted to seven metres. Before reaching any installation decisions, we strongly recommend taking a series of wind speed, force and duration measurements at the project site and to ensure that the wind there is not too irregular with a speed most often over 18 kph. As the wind does not blow every day, it is wise, or even essential, depending on what use is to be made of the well (irrigation, market crops, livestock, drinking water) to plan on building an additional storage pond to have water reserves for a few days or installing a current generator that will supply batteries when an electric pump is used). It is difficult to compare the performance of windmill pumps (for there are very small ones just as there are very large ones) solely on the basis of data provided by vendors, as the latter often tend to overestimate the performance achieved for average wind speeds or provide incomplete data. It is preferable to seek specialist advice and attempt to get the view of those who already use them locally. A windmill’s power should be well suited to the kind of flow expected from the well. If it is fairly deep, for example, there is no point in installing a small or medium range windmill for it would not work well and would only be very effective when the wind is strong, when it will face a breakage risk. - Windmill pumps are fairly strong and can operate for many decades if properly maintained. They are economical and environmentally friendly. 25 cu. metres per day from a depth of 10 metres, with a maximum depth of 25 metres and at a price starting from €500) or the “Sahorès” windmills (30 cu. metres per day from 10 metres, max. depth : 25 metres, price : €700). - They are large, unattractive and may be noisy. 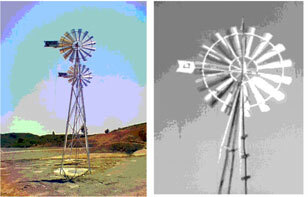 Windmill pumps must be located near the water source, on land with few obstacles likely to slow the wind. They may be costly (even if they cost little to maintain). - They will only operate when there is enough wind and using them for wells deeper than 30 metres is not recommended. The purchase price of windmills is highly variable, depending on the models, materials used, type of pump attached, the accessories fitted and the country, but fairly high. However they have a long service life and low maintenance costs (some twenty Euros per year). To this must be added the cost of building a small water storage pool. To build simple wooden models locally, the cost is only €500 to €1,200 depending on the model. For windmills coupled to (cheap) rope pumps, the cost is some €400 to 700. 9) Where to obtain further information ? An amateur blog with numerous illustrations and building drawings. - ECOLAB Energies. (Supplier of OASIS windmill pumps for individual users). A few page advertising document on this kind of pump, as well as other windmills.